If you’re nearing retirement or have recently retired, most likely you’ve faced a number of important decisions. What age will you stop working? Will you continue to work part-time? Will you stay in your home or relocate? Choosing the right place to live during retirement is an important decision. Many seniors decide that a retirement community is exactly where they want to be. If you’re considering a retirement community, here are a few of the top reasons why many people find them so appealing. Residents of retirement communities never have to worry about yard maintenance. That means you don’t have to mow your lawn in the burning summer heat, you won’t have to rake and bag huge piles of leaves in the fall, and you won’t have to battle the cold (and risk falling) to clear your driveway of snow and ice in the winter. Many retirement communities also handle basic home maintenance issues. So if you need someone to repair the stove, unclog a drain, or redo the roof, it’s covered. This can save you the frustration that can accompany having to deal with these things yourself, and it also means your budget won’t take an unexpected hit because your furnace suddenly quit. Another great thing about living in a retirement community is the amenities you could have available. Many communities offer residents access to services such as exercise facilities, fitness classes, and adult education. Some also have health and personal care facilities on site. With so many opportunities close to home, you may find that you can free yourself of the need to own a car. This is especially true if the retirement community you choose offers transportation. The physical, mental, and emotional benefits of staying socially engaged in your senior years are huge. Socially active seniors tend to live longer, enjoy stronger immune systems, and have a lower risk of dementia. In a retirement community, it’s easy to find and connect with people who share your interests. You’ll have a built-in neighborhood and lots of opportunities for conversations and social activities. Community centers which offer classes or entertainment create the occasion to connect with your neighbors. Retirement communities are frequently gated, and many even employ security staff. If you travel, whether it’s for a weekend to visit the kids or for a more extended vacation, you’ll know your home is protected while you’re away. Even if you simply want to enjoy a stroll around the block in the evening, you’ll be able to do that without worry. Many seniors choose to make the move to a retirement community even if their health doesn’t prevent them from caring for a home. If you move while you’re relatively young, don’t rule out a community that also offers assisted living or nursing care facilities. If you experience a change in health and need a higher level of care, you won’t have to leave the community you’ve come to know. You’ll be able to stay with the friends you’ve made and the staff you’ve become comfortable with. Senior living communities aren’t inexpensive, but when you consider what is included in the price you pay you may find that it’s not as costly as you thought. 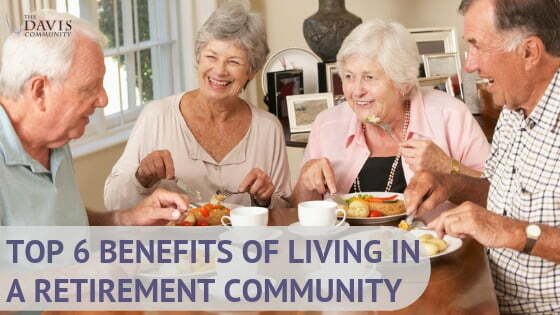 Most retirement communities charge a monthly fee that covers the majority of your expenses. That means you won’t have separate bills for your cable, internet, electricity, heat, and property taxes. And when you consider the money you could save on transportation and entertainment it’s even more cost-effective.